« Garden Update – All Planted! I think I’ve found a new favorite bread dough recipe! I’ve been looking for a multigrain blend in the bulk section of the supermarket, but without success. I decided to give this pre-packaged blend a try. It’s called Bob’s Red Mill Organic Whole Grain Right Stuff 6 Grain. 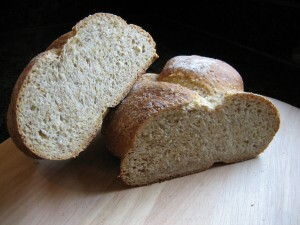 It contains whole grain wheat, whole grain rye, corn, whole grain oats, whole grain spelt, whole kamut grain and flaxseed. I’m glad I gave it a try… it produced an excellent flavor and texture. I also wanted to do a different shape for my bread. I needed a change from the usual boule shape I’ve been doing, so I decided to do a braided bread because I love the way the finished product looks! 14) Remove bread from oven and tap the bottom; if it make a hollow sound it’s ready! Baker’s notes: This bread is delicious!! 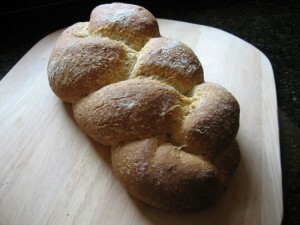 The crust has a nice crunch and the crumb is light and airy. Feel free to substitute the all purpose flour w/ bread flour if you desire.